Last update discussed the potential that one more higher-high might complete Bull 3, and while SPX fell about 4 points shy of my ideal target, we did get a higher high and a reversal, so that might be all she wrote for Bull 3, with the larger fourth wave correction I discussed now on deck. It is still possible for there to be one more small 4th and 5th left to unwind, but I'm not banking on that. I'll attempt to do a more complete update for Thursday, internet connection willing. 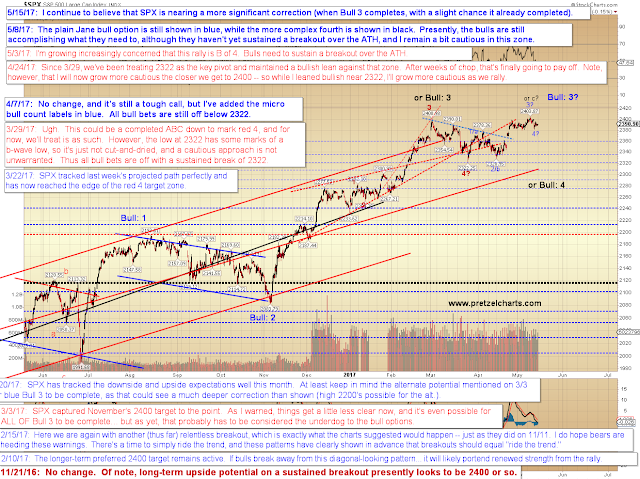 Fortunately, Monday's update was pretty thorough, and the market seems to be playing along with my predictions. Please refer back to those charts if needed. Trade safe.